Should I Sign A Release Or Authorization After My Accident? | Keller & Keller Should I Sign Insurance Company Releases or Authorizations? In this short video, attorney Joe Sukup discusses the purpose of an insurance company's release and authorization as well as why you shouldn't sign your name. "Should I Sign a Release or Authorization after My Accident?" Shortly after an accident that involves injury, you will receive a series of documents from the liable party's insurance company. The paperwork will likely be titled as a “release” and/or an “authorization,” and it will ask for your signature. Before you even think about signing any document the insurance company sends to you, let's take a closer look at each of these documents, discuss their purpose, and how they can dramatically affect the value of your injury claim. 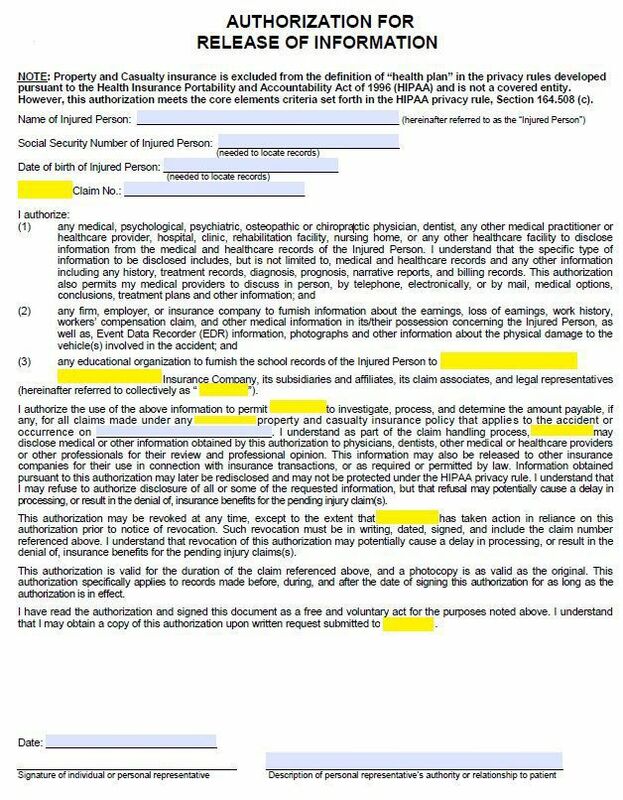 1) The Medical Authorization Release - Allows the insurance company to dig into your personal medical history. 2) The Release of All Liability and Claims - Lets the insurance company "off the hook." 3) The Property Damage Release (Check) - Depending on the amount of damage to your vehicle, you'll either receive a release (check) or have it repaired. Below we’ll look at each type of release in more detail and discuss the consequences of signing one too quickly and/or without an accident attorney first evaluating your claim. The primary factor used to determine the value of your personal injury case will be your injuries and medical treatment. In most instances, when someone else is at fault for an accident that has caused you injury, it’s the responsibility of the negligent party's insurance company to compensate you for your medical bills, lost wages, and pain and suffering. However, there are no guarantees when dealing with an insurance company, and when you sign their medical authorization release it gives them access to your medical history, past and present, and that can mean you're putting your claim at risk, perhaps leaving you with nothing. Why is that? The insurance company’s medical authorization release will often allow them to access prior medical records, well before the date of your accident. Why do they want this information? The insurance company will attempt to relate your existing injuries to information they uncover in your past medical history. For instance, if the accident left you with a torn rotator cuff, the adjuster may find that years prior to your accident you once visited your doctor and mentioned you had shoulder stiffness. They will then use this newfound information to try and decrease or deny your injury claim. The insurance company will scour the records to look for statements you made to the doctor that are inconsistent/contradict with the type or level of your injuries. For instance, you may have suffered headaches as a result of the accident that didn’t appear until a couple days after the incident, but the insurance company is claiming they are not related since you didn’t mention them on the date of the accident while at the ER. It’s very common for aches and pains to appear in the days following your accident. Again, an experienced injury lawyer’s goal will be to relate these pains and dismiss the insurance company’s tactics. In short, this means they will say that even though your injuries were caused by the accident, you were fragile before the accident, thus your claim is not as valuable. These are a few ways an insurance company will use a medical authorization to try and limit or deny your claim. And though they may sometimes find a legitimate excuse to do so, it’s ALWAYS advisable to ask an accident lawyer who limits their practice to personal injury to examine your case BEFORE signing a medical authorization. Eventually, every accident victim who wishes to settle their case will be required to sign this release. However, the difference between a fair settlement and one with minimal value may depend on whether or not you hired an experienced personal injury lawyer to handle your claim and evaluate the insurance company’s offer BEFORE signing a release of liability. We have witnessed accident victims sign a release of liability without fully understanding the finality or consequences of putting their signature on the document. Make no mistake, signing this release is FOREVER. Once signed and received by the insurance company, your claim is closed, no matter what circumstances may arise in the future. Generally, the release of liability will be the last document you’re required to sign before receiving your check. If you hire a lawyer to represent you, it’s sometimes possible that your attorney will prepare the final release for your signature. If you don’t have an attorney, you will be forced to sign the release prepared by the insurance company. All those who were involved in the accident. The defendant(s) insurance company, e.g., State Farm, Geico, Progressive, etc. A statement that says you were involved in an accident on (Date of Accident) that caused injury. A statement that says you are releasing the defendant(s) and the insurance company from any future claims of liability and/or damages related to the date of the accident. Like the unique value of your injury claim, every release will be specific to a victim’s accident. The points above are meant to be a very general overview of what a release of liability may contain. Ultimately, we suggest that you ALWAYS contact an accident attorney BEFORE signing a release of liability. If you’re like the majority of our clients, one of your immediate concerns will be the replacement/repair of your car, truck, or motorcycle. Being without transportation is not only an inconvenience for everyday living, but now that you’ve been involved in an accident it’s imperative that you make all of your doctor’s appointments, and not having a vehicle can make this difficult to do. If it's found that the damage done to your vehicle exceeds its market value, the insurance company will make you an offer based on the present market value of your vehicle in its pre-accident condition. You will receive a check and/or a release from the insurance company, and once the check is cashed or the release is signed, your property damage claim is closed. If the insurance adjuster determines that the damage to your vehicle can be repaired, you will usually be able to request the body shop of your choice to have your vehicle repaired. Typically, there will be no release or check sent to you if the vehicle is not totaled. Instead, the insurance company will pay the body shop directly for all the necessary repairs listed in their estimate and you'll be required to sign off on those repairs. Never be afraid to contact a personal injury lawyer to discuss releases or authorizations related to your accident claim. The advice you may receive could increase the value of your claim; stop you from being pressured into signing; and possibly save your entire claim. Keller & Keller's personal injury lawyers offer all of their callers and clients a Zero Fee Guarantee. This means that you'll NEVER pay for a consultation fee and the only way our firm receives money for its legal services if a recovery is made on your behalf. No matter how big or small your case, we're available to talk to you about the language in your release and/or authorization. If you've been involved in a car accident, semi-truck accident or motorcycle wreck, you must speak with an experienced personal injury attorney as soon as possible. Contact us online or call us directly at 800.253.5537 for your free consultation. ?How does witness testimony help a claim for compensation after an Indiana car accident? ?What can I post on social media after my car accident? ?Does new car technology actually keep us safer? ?What can I do to help my car accident attorney with my case? ?Do I need to hire an attorney for my Indiana car accident claim? ?How long will my car accident claim take?